“Place” is a word that embodies the idea of belonging somewhere–“everything in its right place,” “put him in his place”. For such a common and frequently used word, it possesses an incredible amount of sentimentality and power. Place, within the realm of art, holds a prominent and constantly visited position. It is an idea that has been taken, sculpted out of clay, smashed, and rebuilt more times than we can count. From Monet’s landscapes on display at this past summer’s Impressionism blockbuster at the Philadelphia Museum of Art to the fresh works of painter Becky Suss at the Institute of Contemporary Art, it is apparent that landscape and the notion of place will endure another set of transformations in the years to come. 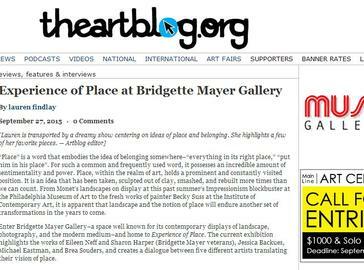 Enter Bridgette Mayer Gallery–a space well known for its contemporary displays of landscape, photography, and the modern medium–and home to Experience of Place. The current exhibition highlights the works of Eileen Neff and Sharon Harper (Bridgette Mayer veterans), Jessica Backhaus, Michael Eastman, and Brea Souders, and creates a dialogue between five different artists translating their vision of place. Eileen Neff is no stranger to place. There’s a good chunk of her portfolio that is strictly landscape-based–her last show at Bridgette Mayer, Traveling Into View, contained images from a recent residency in Costa Rica, and we can still taste the humidity in the works at Experience of Place. Neff’s work usually possesses a certain crispness and exquisite sense of calm, which was apparent in her last show. This time around, Neff uses warmer saturations in a few of her photographs to create a rather unsettling, eerie effect. “Clouds Below,” in particular, was a standout. The dark, blurred photo appears to be have been taken from the window of a moving vehicle, or with unsteady footing at the top of a mountain. Black trees and gray skies are permeated by ocher-yellow clouds so dense, they look like snow. The silhouettes of tropical trees lead me away from the thought of snow, and more than anything, we can feel the thickness of the air. The light imitates the sepia coloring of the first color photographs–dark, moody, romantic, and incredibly unsettling. Similar to “Clouds Below” is “Sun Setting,” which contains more of Neff’s trademark crispness, but possesses the same coloring as “Clouds”. However, the former appears to be taken from the top of a mountain while the latter seems trapped–perhaps “Sun Setting” is the photo representation of someone wishing to go to “Clouds Below”–and from there, our emotions toward Neff’s work shift into an idea of yearning to travel, an undying wanderlust. And on the topic of wanderlust, we travel to the works of Sharon Harper. Harper, also a veteran of Bridgette Mayer, consistently channels a love of science and the sky into her mechanical, scientific works. Neff and Harper present similar notions of wanderlust and exploration of the unknown world–a small selection of Harper’s work in this show includes tropical, volcanic images from Hawaii, New Mexico, and the Canary Islands. They are huge, glossy images that look like they’re fresh off the press of National Geographic. “Native Fruit Cairns and Offerings” is a gray image of volcanic rock with fruit that is such a bright shade of green, it almost hurts our eyes and bleeds from the frame. Harper also shows a grouping of her more traditional work at the back of the gallery, with a triptych of fiber prints entitled, “Watching the Grand Canyon for an Hour (5:11 AM – 6:11 AM”. This is the breathtaking work that we ache to see from Harper, and that she continually delivers: shimmering vignettes of beauty that could only be captured by a camera. The most magnetic part of these is not the location itself; one almost cannot even tell what is in the background. What is so astonishing are the shimmering reflections of light bouncing into the camera and creating transparent, geometric shapes in the lens–something our naked eye would not be able to capture on its own. The presentation of these photos is like looking at something a NASA scientist would be trying to make sense of, an image from another part of the galaxy, a sunrise on another planet. We would never be able to see these images if not for the magic of photography. This tiny machine manages to capture an entire realm of light and imagery that our human eyes are not advanced enough to view. Perhaps a slight bit more in our bounds and just a tad more playful in subject matter is Jessica Backhaus, who presents us with a kaleidoscope of C-prints that take the viewer back to Southern California in the 1970s–fuzzy like a daydream. Her images display shots from windows, in rippling puddles, double exposures, fading, and truly extraordinary colors. The poetry of Backhaus’ work is that we cannot fully see anything–we get a feeling that she doesn’t want us to peer into her memories, or, perhaps, that the memories captured in the photo are already being forgotten. We can only see hints of buildings, flashes of color, slight ideas of geography. There’s a faint resemblance to El Guicho’s “Bombay” music video (directed by Nicolás Méndez), which is a combination of a vintage, 1970s-era filter on the camera, and the modern themes of pop culture that all of the millennials seem to love. Brea Souders, in a similar fashion, takes the photography norm of our day (hyperreal, journalism-esque) and transforms it into something authentic and refreshing with vibrant saturation and crisp, playful imagery. Belize plays into the theme of the show with a sliver of tropical colors and textures. Souders, whose process includes taking photo scraps and negatives and repurposing them, creates a tasteful and minimalist image that really emphasizes on the beauty of the color in her location (and clearly takes a cue from Eileen Neff’s Traveling Into View show, which I previously mentioned). Even more interesting is the relation to the first color photograph by James Clerk Maxwell of a Christmas bow. Another notable piece is “French Bed and Moon,” an image of a photo resting on a bed with a loud, pink floral cover. Also included in the show is Michael Eastman, whose opulent and ornate photographs are reminiscent of the home style sections in Vanity Fair or Vogue. The chromogenic prints each have some sort of doorway or portal: from an arch in a beautiful living room to a view from the top of an electric-yellow escalator, the door is something we notice in his work. “Moorish Facade” takes a brilliant blue Moroccan archway and, through the doorway, we can see a collection of plush, red velvet couches–a scene that could have come straight from an Ingres painting. Eastman’s work, along with the rest of the featured artists, does not necessarily exude a sense of belonging, so much as a feeling of wanting to belong–yearning to be somewhere else, whether it be Hawaii, Morocco, a hazy bedroom, or a world between worlds. Experience of Place is on display at Bridgette Mayer Gallery until October 30, 2015.